Enjoying a sunny fall day, I walked around the National Mall on Saturday afternoon. Before visiting any other favorite sites, I ascended the temple steps where Father Abraham presides on his throne over American civil religion. 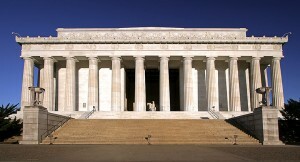 Designed to recall the Greek Parthenon, this memorial secures Lincoln's place in the American pantheon. If you champion a social cause and want to leave your mark on America, you must at some point make the pilgrimage to this hallowed ground. All the better if you can deliver a speech that incorporates elements of Lincoln's famed Gettysburg Address. Only three weeks earlier self-appointed political prophet Glenn Beck claimed Lincoln's imprimatur by packing these same steps for a rally. But religious nationalists who invoke America's greatest president never seem to understand the irony of his memory. The man who saved the Union understood that God transcends and judges it. God's ways often surpass our understanding. We cannot manipulate him to baptize our pet causes. Read Lincoln's Second Inaugural Address, a stunningly moving model of public theology written by a man whose true beliefs elude historians still today. No, actually read the speech and marvel at this man's magnanimity after four years of shockingly bloody killing. He captured in this speech a mature political philosophy that shamed the many warmongers masquerading as pastors in both the North and South. Even today, the church cries out to God for him to raise up more pastors and theologians who can help the evangelical public understand that for all this nation's blessings, Jesus Christ didn't robe himself in an American flag. While Dever may serve a church on Capitol Hill, he does not commonly address issues of Christianity and government so directly. But as an expository preacher working his way through the Gospel of Mark, Dever obligated himself to address Jesus' teaching in Mark 12:13-17. In these days of overheated rhetoric and protest rallies, I pray that evangelicals will set aside 70 minutes to listen to Dever's sermon. Much of the wisdom expressed here echoes the forthcoming book City of Man: Religion and Politics in a New Era, written by Michael Gerson and Peter Wehner, with a foreword by Tim Keller. We need to hear from the best evangelical thinkers about a faithful, biblical approach to politics. Perhaps I can help the cause by summarizing four pages of notes I scribbled from Dever's sermon. Dever, who earned his PhD at Cambridge, described in the introduction his experience debating a Muslim friend who claimed Christians have no vision for the state and society. It a common objection, stemming not just from Muslims who unite religion and state but also from Marx, Freud, and other atheists who have regarded Christianity as passive escapism. So is their charge true? Does Christianity have anything to say, Dever asked, in a society where it's more acceptable for a man to have a husband than to pray in Jesus' name in a public school? Jesus sets out a novel, revolutionary philosophy in these five verses, Dever argued. By way of background on this confrontation between Jesus and his religious opponents, Dever explained that Jesus posed such a great threat to Jewish leaders that he united bitter enemies from among the Herodians, who conspired with Rome, and the Pharisees, who rebelled against Israel's occupiers. Together, they approached Jesus, hoping to catch him in a trap. They asked, “Is it lawful to pay taxes to Caesar, or not? Should we pay them, or should we not?” (Mark 12:14) By answering, Jesus was in danger of losing either his popularity or his life. In fact, he lost both after a shocking response that subsequently formed the basis for all Western political philosophy. 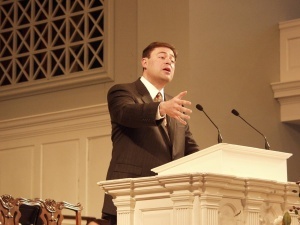 In his first of three main points, Dever said Christians are good citizens. Though Jesus later suffered the vengeance of his enemies, he actually escaped the rhetorical noose with his answer here. Jesus regarded the pagan state as legitimate when he said, “Render to Caesar the things that are Caesar's” (Mark 12:17). The answer stunned the Herodians and Pharisees, because whatever their differences, Israel and Rome both derived their legitimacy by divine appeals. Human government is deeply biblical. Dever looked back to Genesis 1:28, where God commanded Adam and Eve, “Be fruitful and multiply and fill the earth and subdue it.” Authority, by nature, reflects God's authority. Romans 13 echoes this foundational biblical theology as Jesus developed it. “For there is no authority except from God, and those that exist have been instituted by God” (Rom. 13:1). Government is not specifically Christian, but it is good. Certainly order is better than organizing society around unfettered self-interest. Americans, given our history, often struggle to see authority as good. But Scripture compels us to obey. “Pay to all what is owed to them: taxes to whom taxes are owed, revenue to whom revenue is owed, respect to whom respect is owed, honor to whom honor is owed” (Rom. 13:7). Dever encouraged and thanked the many members of the congregation who work in government. In his second point, Dever argued that no earthly kingdom can be identified with God's people. Christians are international. With his answer, Jesus unhitched God's people from any one government, severing the national covenant that extended all the way back to Moses. If followers of Jesus could support Rome with their taxes, which government today—no matter how corrupt—can't Christians support? Muslims often debate how they should live in lands not ruled by Muslims. But Christians have always lived like exiles. As such, the apostle Peter tells Christians, “Be subject for the Lord's sake to every human institution, whether it be to the emperor as supreme, or to governors as sent by him to punish those who do evil and to praise those who do good” (1 Pet. 2:14). Indeed, whatever Christians do, we should do it for the benefit of others. When we do good, we “put to silence the ignorance of foolish people” (1 Pet. 1:15). We should “honor everyone. Love the brotherhood. Fear God. Honor the emperor” (1 Pet. 1:17). Yet while we honor everyone, we delight in knowing that we share more in common with Christians from different nations than we do with our unbelieving countrymen. We especially seek to serve these brothers and sisters, who are children of God by both creation and also redemption. With his third and final point, Dever argued that Christians are finally accountable to God. Many remember that Jesus told the Pharisees and Heroadians, “Render to Caesar the things that are Caesar's.” Not so many remember that Jesus ended his teaching by saying we should render “to God the things that are God's” (Mark 12:17). While Jesus commanded obedience to the state, he undermined its final authority with this phrase. The type of denarius Jesus requested to see bore an inscription: “Augustus Tiberius, son of the divine Augustus.” Jesus may have called for obedience, but he flatly rejected all such worship of Roman emperors. Thus, our duty to earthly authority is limited, Dever taught, a fact that becomes clear when authorities clash. Friends, this is one of the problems with referring to any country as a “Christian nation.” Just because the principles of Christianity clearly influenced our nation's founders, and some of them were themselves evangelical Christians and even if the Supreme Court has recognized the long history of significant Christian influence in our nation, that does not mean that most Americans are Christians or that a Christian worldview dominates our public culture or our government today, or that one needs to be a Christian to be an American citizen. I was in the robe-chamber, adjoining the House of Lords, when the King put on his robes. His brow was much furrowed with age and quite clouded with care. And is this all the world can give even to a king? All the grandeur it can afford? A blanket of ermine round his shoulders, so heavy and cumbersome he can scarcely move under it! A huge heap of borrowed hair, with a few plates of gold and glittering stones upon his head! Alas, what a bauble is human greatness! And even this will not endure. If we were ever tempted to invest our hope in the state, we should remember that Americans live in a country where spanking children is suspect but aborting children is okay. Christians eagerly long for such a day when abortion will be no more, when human authority will cease, and when partisan squabbling will come to an end. Though Jesus sowed the seeds of demise for Israel's nationalism and Roman paganism, he focused his efforts on a much more important revolution. He conquered sin and death on the cross and in the resurrection. We should return coins to Caesar, but we must give ourselves to God. Jesus came to collect what was due: his elect. The Pharisees and Herodians who questioned Jesus would not pay the price of belief, and God will judge them for rejecting his Messiah. Likewise today he will judge Muslims who worship a false god that compels only external conformity rather than the one true God who changes our very nature. Let us give to God what is God's, Dever exhorted. Everything is God's. Let us pay our taxes. But even more, let us trust in Christ.